I saw Julie & Julia a couple nights ago and it left me with a myriad of reflections about the food world. First of all, let me be honest: I only heard about Julia Child a handful of years ago. Growing up in Paris, as you can imagine, Julia Child was not a renowned name and her legacy had never made it to my though curious Parisian ears. A couple years after I moved to Montreal, Oliver came back from one of his second-hand book hunts with a grin and a copy of Julia Child's "Mastering the Art of French Cooking". It had cost him 10 dollars, was in mint condition and just asking to be used. I flipped through the pages of this brick of a book (a masterpiece alright!) and recognized all the recipes that make up classic French cuisine. Julia Child's explanations of how to make each dish was the most entertaining and valuable part, and it did make me think that no matter your lack of knowledge on the matter, you could probably whip up a boeuf bourgignon or the perfect onion soup on any given day. Then, I did what any normal product of the 21 st century would do: I googled. I googled Julia Child's photo, extracts of her cooking show and read up on her biography. I already felt like I knew who she was. Better still was the particular ring of her tone of voice, and the awkward yet charming way she had of carrying herself while showing you how to truss a chicken or make the perfect omelet. I was sold. Since that moment, I've heard her name over and over and over again and can only give her my blessing for what she was able to do for Americans. I don't believe these recipes were anything of a creative breakthrough - these are, after all not Julia Child's recipes, but rather the classic recipes found in most old school restaurants in France - but Julia Child made it possible for the housewife of her time, wherever she might be, to bring a taste of France to her family. Julia Child was, in effect, the one who made it possible for home cooks to buy raw ingredients and turn them into a real show piece at the dinner table. Seeing Julie & Julia made me think about the essential role of transmission in the food world. Our grandmother's recipe has special importance to us because it was passed down from generation to generation and making it in our kitchen makes that tradition live on. Julia transformed these French recipes into understandable terms and allowed that transmission to occur for Americans. She took her immense love of French food and transferred it to all those who wanted to learn about it like she did. The movie touched me. To think that someone like Julie Powell felt empowered because of Julia's recipes truly hit a soft spot for me. I think, secretly, when you write a recipe, you're always trying to bring a feeling of empowerment for people who try it. You want them to succeed. The power of food really does go beyond the wonderful taste in your mouth. Sure, the Julie in the movie did seem rather self-indulgent and sulky, but who am I to talk? Aren't we all a little? I started reading Julie's blog (I had only read excerpts as of now) and maybe I will come back to you with a stronger opinion on the matter after I'm done. Now.. for today's recipe. Poached Pears. Dipped in Chocolate. Need I say more? That pretty much did it for me! In a small saucepan, add the water, ginger, lemon and sugar and bring to a simmer. In the meantime, gently peel the pears (leaving the stem intact). Once the liquid comes to a simmer, add the pears. Turn them often to make sure every side is in contact with the poaching liquid. Poach for 15-20 minutes or until the pears are fork-tender. If the pears start to change color, and a little lemon juice. Once the pears are ready, remove from the liquid, dry them and place in the fridge (at least one hour). Slowly melt the chocolate in a double boiler, and place the chocolate in a small bowl. Drizzle the melted chocolate on the pears, starting where the stem touches the fruit. Leave to harden and serve. Enjoy! It was a great movie and she was a memorable person. She did more for cooking in America than any who came before her. As to your pears - they are drop dead gorgeous. Thanks so much for your comment on my blog,and for leading me to this stunning site! I've added you to my Google Reader and can't wait to see what dishes and photos you'll be coming up with. And a compliment on my photos just made my day (especially coming from a photographer!) --I am really just hoping for the best each time I snap one! I loved the movie, for sure! Great to hear others thoughts onit. This pear looks amazing! YUM! That looks like a nice way to enjoy a pear! I have been wanting to try poaching pears for a while. The pears look stunning! A nice port and a chocolate dipped poached pear and I think the evening would be perfect. The movie Julie and Julia hit a soft spot with me too. Wow! This is such a terrific recipe - ginger flavor sounds wonderful and very decadent dipped in chocolate! Gorgeous! What a wonderfully simple treat, and you executed it beautifully! oooh mon dieu, les poires.... they look amazing... you need a warning on your page, a caution that "Photos may cause uncontrollable drooling" and that "I am not responsible for any embarrasing shirt stains this may incur when viewed". I haven't yet seen the movie (don't think it is here yet in NZ) and I haven't ventured onto the Blog either but I will have a peek after reading your blog. Love the idea of your pears poached in ginger, the combination with chocolate sounds great. I can't wait to watch the movie this weekend! I've only heard of Julia a few months ago through other food blogs. Julia was such an inspiration in my cooking when I was just starting out. I can understand why she wasn't well known, or known at all for that matter, except in the US. I'm so glad this movie was able to touch another whole audience for her who didn't know her as we did here in the states. 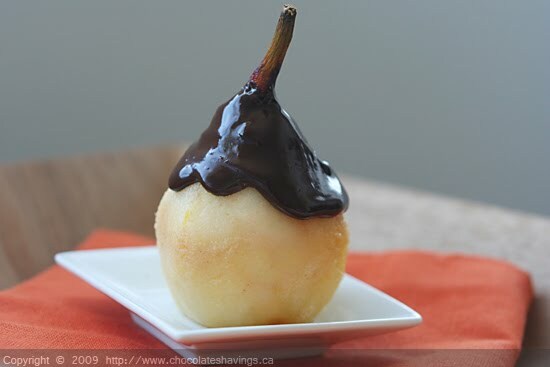 Your chocolate dipped pears are heavenly. Pears and chocolate -- yum, how can you go wrong? I loved your story about not having heard of Julia, but learning to love her through a second hand book purchase and some of her online videos. My mom had a Julia Child dinner party a week or two ago which I blogged about, and I made one of Julia's dishes, a pear dessert as well. It was grand fun. Aren't these pears yummy this time of year? On Friday my sister, who had beeen hounding me to see Julie and Julia, and I went and saw it! I loved it and was so inspired to make more french food. Butter is your BFF!